a little whimsy and wisdom to your week and weekend. I have done activities like this before where you stand on one side of the room to represent your preference. I also conduct professional development with our high school students on "Managing their Digital Lives" (that info can be found here). We don't do an activity like this but I absolutely love it so "stealing" it and the prompts. Hoping Common Sense Media creates more of these prompts to be used with secondary students. I am such a firm believer in conversation before contracts and I thin this is such a great way to engage students. The Calm Initiative Gives Every Teacher a Free account. Their site says that "teachers will have unlimited access to our growing library of guided meditations and mindfulness exercises, including Calm Kids, our programs tailored for age groups from pre-K through high school." Quizziz has some new features. Now there is a flashcard mode. You can find it on the "Activity" page for students. Joan and Janet say, "Click any quiz that you've completed, and you'll see 2 buttons "Play" and "Review" (Review is the flashcard mode). Just click it to see the new mode. They are planning to change that button to say "Flashcards" (or something similar)." LogoMakr: This is a site that works on both an iPad and a browser. Students can create their own logos for projects and it includes over 1 million graphics! 😍Person You Need to Follow on Instagram: I adore Michelle Rohr. She is such an amazing person and she creates awesome printables (both for digital and analog use). I know... you had me at printables... Right?! If you are deep in to your copy of "Creatively Productive", you might remember her from chapter 5. I featured her "Positive Self Check-In". She also posted this digital prompt grid where you can include photos and I am slightly obsessed with this idea! She is such an inspiring woman and such a great gal to help you embrace your intuition. 📗Book I Am Reading Next: I finally have a bit of down time to start reading again. Once I get home, the next book on my list is "40 Ways to Inject Creativity Into Your Classroom with Adobe Spark" by Monica Burns. Monica is prolific with her posts and great ideas that she shares AND such an amazing example of the power of visuals and visual literacy. We got to hang out at TCEA this week and even do a Facebook Live book talk about both of our books. The link to the 20 minute archived talk is here. 🎉Just a quick heads up. TOMORROW (Friday 2/8/19) is the last day to take advantage of the "Creatively Productive" Flash Promo! Order the paperback or the kindle and get 6 PDF trackers with the book. The 6 trackers are explained in greater detail in chapter 4 and 6 of the book. The promo package includes a habit tracker, sleep tracker, water tracker, mood and gratitude tracker, reading tracker, and a reading next tracker. These can be used personally, professionally, or with your students! Don't miss out on these goodies. 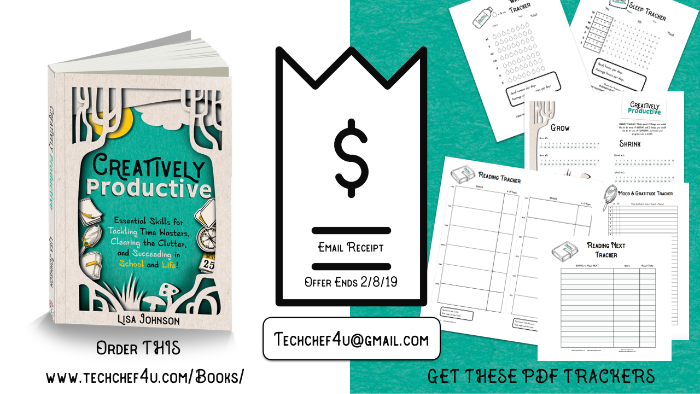 Where I'll Be: If you are looking for some IRL TechChef "Creatively Productive" sessions, I will be at TCEA , .EDU, and Learnfest. 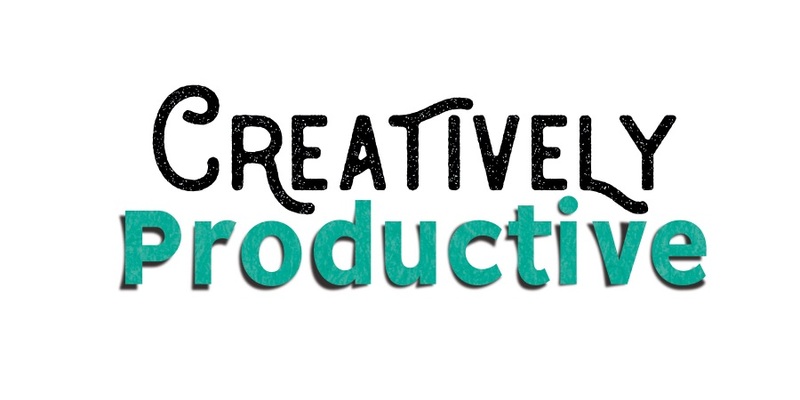 If you are loving the new "Creatively Productive" newsletter, please share with others. Copyright © *|2019|* *|Creatively Productive:TechChef4u LLC|*, All rights reserved.